You might want to search the web and social media for trends and information about similar products, services, and businesses; as well as search out your competition. Here are some inside tricks of the web search gurus. 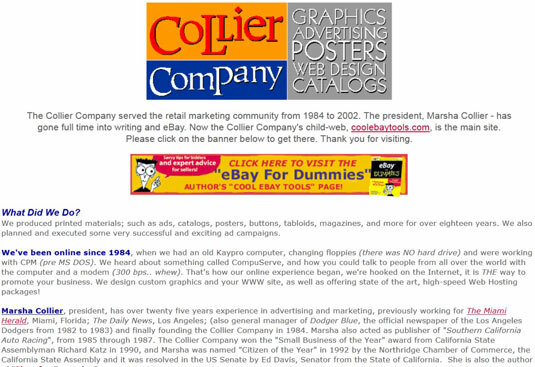 Here is an example of a business website that first went online in 1996. The owner learned early about the wealth of knowledge that can be found by performing in-depth searches. Finding esoteric information online became a passion for this person. She uses the information in her business and when researching for the books she writes. An early business website, circa 1996. If you are in a pinch and don’t remember the search operators described in this section, go to Google’s Advanced Search page. From that page, you can include and exclude words and phrases and even find free images to use. 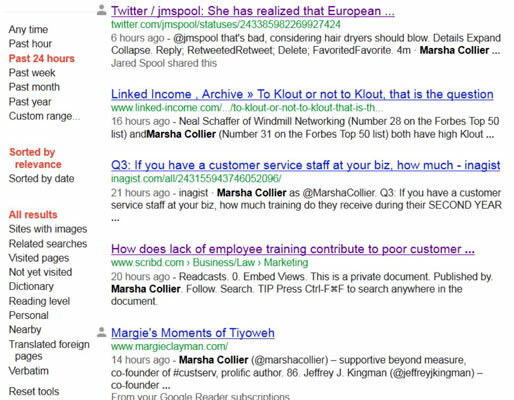 On the left side of a Google search results page, click Show Search Tools. In the resulting list, click Verbatim. In the search box, type your search terms, and then click the magnifying glass icon. On the left side of a Google search page, you see a category list: Web, Images, Maps, Videos, News, Shopping, Books, and More (clicking More displays more categories). Below that list you might see name of the city you are in, and an option to change the location (in the case of a location search). At the very bottom of these links is a Show Search Tools link. Clicking this link displays the menu shown in the figure so you can select the timeframe in which you’d like to search. The Show Search Tools link displays many handy variables for this 24-hour search.